Potential new targets include the systems that allow bacteria to grow and to reproduce. This includes systems bacteria use regularly to take up essential nutrients from their surroundings, such as the soil or an animal host. Smith’s lab focuses on how biological systems take up and process iron, and he’s just received a two-year grant from the National Institute of Dental and Craniofacial Research, a division of the National Institutes of Health, to explore how the bacterium Porphyromonas gingivalis takes up reduced iron, a specific form of the element. P. gingivalis is responsible for gingivitis, a gum disease and one of the most common infections worldwide. Virtually no living thing can survive without iron: It’s critical for DNA synthesis and other metabolic processes that “help drive the chemistry and survival on our planet,” Smith says. Plus, the way bacteria take up reduced iron is very similar across all species—unravel the way one species does it, and you’re much closer to understanding them all. Aaron Smith works in the lab with graduate students Alexandrea Sestok, Verna Van, and Nathan Max (from foreground to background). Virtually all bacteria use something called the Feo system to take up iron. In many bacteria, it consists of three proteins: FeoA, FeoB, and FeoC. FeoA and FeoC play supporting roles, while FeoB is the “gatekeeper that sits in the cell membrane and transports reduced iron to the inside of the cell,” explains Smith. However, there is evidence that without FeoA, FeoB can’t do its job nearly as well. “Despite the fact that it’s a small protein, FeoA appears to have a really big role in iron uptake,” Smith says. “We’re interested in understanding how FeoA and FeoB are interplaying with one another, and how that might drive or regulate the reduced iron uptake process. If we can understand how that process works, then we can think about ways to disrupt that process.” That could lead the way to new antibiotics. In the last six months, the lab made a breakthrough by solving the atomic structure of the FeoA protein in a different bacterium. The structure reveals a strong candidate for the exact site on the FeoA protein where it binds to FeoB. Previous research has indicated where the binding site is on FeoB. One of the goals of the new grant is to confirm these binding sites in P. gingivalis. 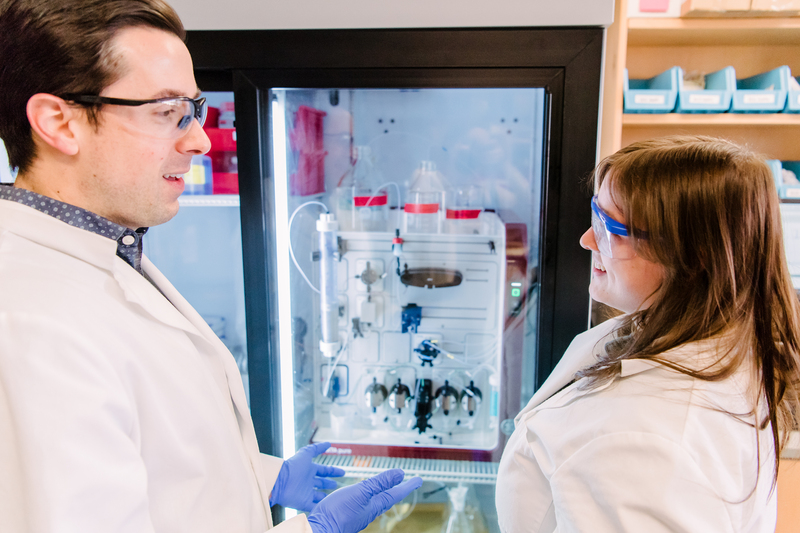 Aaron Smith and Alexandrea Sestok discuss the capabilities of the lab’s fast protein liquid chromatography instrument. Smith is hoping the crystallography work will identify which amino acids (the building blocks of proteins) in FeoA are critical for its proper interaction with FeoB. To further test those ideas, they’ll genetically modify the bacterium at the indicated amino acids and see if it can still survive on reduced iron. “Those results could give us a really strong insight as to whether iron uptake might be a viable target for disruption,” Smith says. The lab also plans to collaborate with Robert Ernst, professor of microbial pathogenesis at the Maryland School of Dentistry in Baltimore. 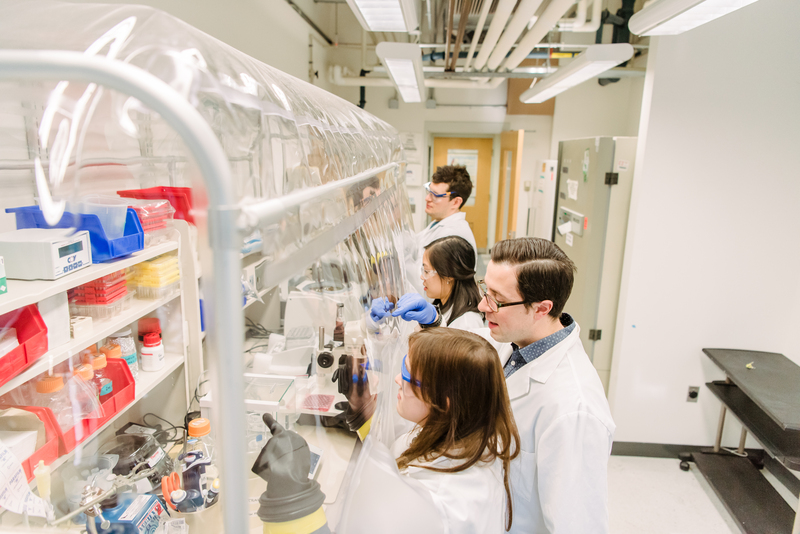 The grant will support training for graduate students in the Chemistry-Biology Interface program, a joint venture between UMBC and the University of Maryland, Baltimore funded by the NIH. Banner image: Aaron Smith in his lab. All photos by Marlayna Demond ’11 for UMBC.